You already know London. Everyone knows some part of London, and everyone has their own ideas about what it is — based on traveling, studying abroad, living here, or even too many viewings of Notting Hill or Sherlock Holmes. But, saying that you know London is like saying you know the United States — the place itself is so vast that it’s impossible to make generalizations. So, we’re not going to tell you about Buckingham Palace, or the changing of the guard. We won’t tell you to walk around Hyde Park, or to get a cocktail at the Ritz. If you want to do those things, you’ll do them anyway. You don’t need us for that! What we will tell you about is how to love London. The city can feel cold, it’s true: Compared to New York, it positively sprawls. And, it takes some adjustment. It’s not just America with a different accent; it’s an entirely different culture. By embracing a few life experiences, we know that you’ll find the perfect London: your London. Here are 10 ways to make London yours. One of the most glorious aspects of British culture is the way the natives embrace ceremony and celebration without going over-the-top. The best way to enjoy this is to have afternoon tea inside of one of London’s many tearooms (these are often found in fancy hotels, but it’s now not uncommon to find hipper alternatives in the most unlikely places — like beneath a church or tucked inside a street in East London). The concept of afternoon tea was created because the British needed a meal to fill that long time between lunch and dinner — and, while you never knew you needed this too, once you sit down to buttery scones served with clotted cream (there is not substitute for this creamy, rich topping in America) and jam, as well as finger sandwiches and an array of petit desserts, you too will wonder how you ever made it to dinner without miniature-sized food, and a hot cup of fragrant tea. The occasion is also very, very fun because the food comes out on elaborately stacked tea trays, and the tea menu itself is a page long. This is a must. Try Claridge’s (for fancy), Harrods (for a more relaxed atmosphere), and The Tea Rooms in Stoke Newington for a more indie vibe. Fortnum and Mason, the world-famous gourmet store, is also excellent. 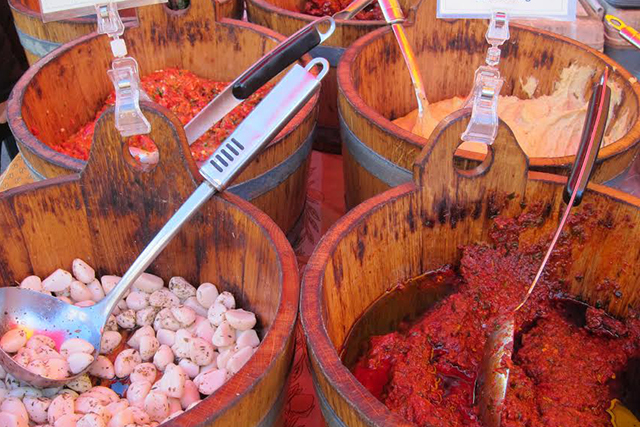 London’s outdoor food markets are some of the best in the world. You could spend an entire afternoon wandering around Borough Market sampling eating various cheeses, cured meats, and cupcakes and then stopping to eat slow-pulled pork sandwiches, spicy curries, or Moroccan chicken wraps. It’s busy, but worth it. Borough Market is right near London Bridge, one of the most scenic parts of London. As you cross the Thames, either on foot or on one of the red double-decker buses, you will definitely feel like you could have stepped into the 19th century. There are also smaller food markets dotted all over the city: Search for them at Southbank or catch one of KERB’s lunch markets — the food at these stalls is so good that Londoners will stand in the freezing rain waiting. It’s worth it. Try Borough Market, KERB’s various locations, and Camden Lock. And no, that does not necessarily mean that you have to head to Soho, the center of 1960s Swinging London (though fun can still be had there). These days, the most fun can be found when you head out to the East End of London. Dalston is excellent; Shoreditch is slowly losing its rough, lively edge and becoming a bit banker-ified, but it’s still guaranteed to house many lively bars and clubs. Within Dalston, Passing Clouds is great for hipsters covered in glitter; Dalston Superstore has great dancing (but few straight men). Be prepared to see anybody and everybody, and don’t judge — that’s the fun of it. If “Cheryl” the party is in town, stand back and watch your stereotypes of the stiff upper-lipped British get blown out of the water. Also, have you ever seen English men dance? It’s amazing. Try Dalston Superstore, Passing Clouds, or The Old Blue Last in Shoreditch. London has been the home to so many literary figures that while walking through the city, you’ll inevitably spot a blue historical plaque marking the significance of a building. You’ll look up while in central London in Holborn, and suddenly read “Charles Dickens lived here.” In Fitzrovia, you’ll stumble upon a blue plaque on a building that tells you the great novelist Virginia Woolf lived in the very building you are standing in front of. 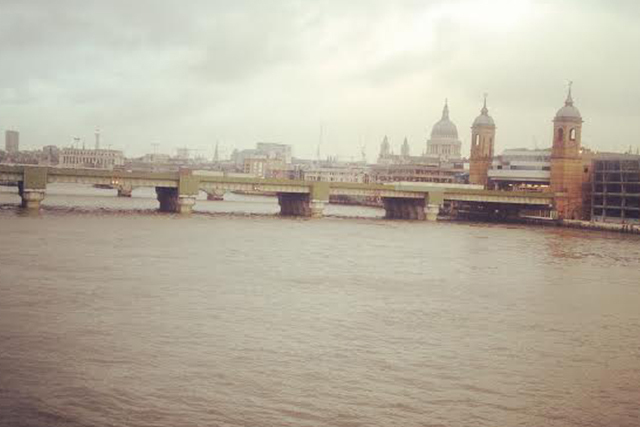 They say London has more ghosts than any other city — but try not to let that spook you. Instead, embrace all the creative talent that walked the very same streets as you. And, if you’re looking to reread the classics or find new English literature, head to bookstores or various readings around the city. Check out Foyle’s, Waterstone’s, and Daunt Books. Keep an eye out for readings — we’ve met Helen Fielding, Ali Smith, and Michael Palin at book events in the city. Before or after you’ve tracked down your particular heroes from history, go immerse yourself in the history of the nation. How to do it without getting overwhelmed? Well, the National Portrait Gallery, of course! Around the corner from the National Gallery, the Portrait Gallery is distinct and arranged by period. It’s full of faces, full of stories, full of legends. And, when you get bored, you can always go stare at the painting of Prince Harry down on the ground floor. Then, ease into the British Museum — it’s astounding to see the amount of loot the British have accumulated throughout their colonial years. When you’ve exhausted yourself, this is a good time to have afternoon tea again. You deserve it. When you’re done, you can head to the museums that stay open late: head to Victoria & Albert Museum on Friday evenings to get your art and design fix. National Portrait Gallery, British Museum, or Victoria & Albert Museum are always a good idea. The first thing you need to do after you arrive at your accommodation in London is find a cozy pub within the vicinity. From here on out, you shall refer to this as “your local.” You should end most nights with a nightcap here, and you’ll find that the staff will soon recognize you, and suddenly London won’t feel so big. If you’re in town on a Sunday, make sure you have a Sunday Roast in the late afternoon, or early evening at a gastropub (avoid ones with televisions, betting machines or the stench of decade-old spilled beer). This dining tradition is so good, it’s a wonder why we haven’t brought it over the Atlantic. Order roast beef, chicken, or even pork belly. Each of these will come with roast vegetables, a towering Yorkshire pudding (a puffy, light, savory bread) and gravy. If it’s summer, find a pub with a garden (British for any outdoor space — do not expect actual roses), and drink a pint of fruity cider. Feel free to linger and be lazy with your fellow locals. You’ll wish every day was Sunday. Try literally any pub (found on nearly every corner, often with names that are some permutation of the words king, arms, royal, lion, horse, or swan). Paris may be the city of love — but flirting with the witty Brits can be much more fun than sparring with the moody French. Even if you don’t meet the love of your life, spend time sharpening your wits and bantering with a British lad or lass (you can find them in almost every pub). After all, we wouldn’t want you to leave London without experiencing what is really the city’s greatest treasure: British humor. Sure, they’ll think you’re too loud, too forward, and that you really shouldn’t be wearing flip-flops in public, but it’s all playful teasing. There’s a reason there are so many Anglo-American couples: Emma Stone and Andrew Garfield, Gwen Stefani and Gavin Rossdale, and Jennifer Lawrence and Nicholas Hoult understand that the union between Yanks and Brits can be a beautiful thing. We recommend any pub that is showing a football match — but arrive in early evening after the match is over (unless you want to see angry Brits yelling at the television). The city has so many strange charms. Fancy a cup of tea while sitting among a bevy of purring cats? Then head over to London’s first ever cat cafe, Lady Dinah’s Cat Emporium. Want to grab the quickest cup of coffee in the world and pay nearly nothing? Head to London’s first pay-per-minute cafe, Ziferblat, where the drinks and food are free. If you feel like working out old-school style, head over to The Third Space near Piccadilly and get a day pass; they have an amazing retro gym, fitted complete with balance beams and climbing rope (in case you were one of those children who actually enjoyed gym class). Dine amongst felines at Lady Dinah’s Cat Emporium, grab a very quick bite for nearly nothing at Ziferblat, and get into shape at The Third Space. But, that doesn’t mean we can’t try. Dine as close as you can get to Harry and Wills by grabbing something to eat at The Orangery in Kensington Gardens, only yards away from the palace. You can go Kate-watching at the Whole Foods on Kensington High Street, but don’t blame us if you feel like a crazy stalker, and she never appears. If all else fails, return to the National Portrait Gallery and stare wistfully at their portraits. And hey — looks like it’s tea time again! So, everybody wins. Keep your eyes peeled out at Claridge’s Hotel, or anywhere in Chelsea. You’re probably going to get a craving for green space in London — and, okay, we’ll concede that you should probably see Hyde Park and Kensington Gardens at some point. But, London is really a city full of parks, and if you limit yourself to those areas, you’ll truly be missing out on some grassy gems. Catch views of the Ritz and Buckingham Palace (without having to pay for a cocktail or admissions ticket) from Green Park; feed the (surprisingly aggressive) ducks at St. James’s Park. North Londoners can wander the rose gardens in Regent’s Park; visitors even farther north can visit the windswept Hampstead Heath, and look out over Parliament Hill, as Churchill is said to have done. Wander over to Primrose Hill to brush up against British celebs and posh Londoners. 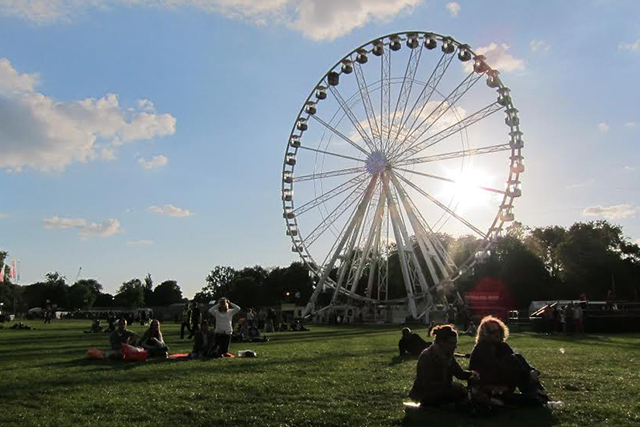 Get thee to Green Park, Regent’s Park or Primrose Hill. Bring a blanket and a bottle of Pimm’s, an English summer drink, because guess what — drinking in public is allowed in England. London is one of those cities that is so big it feels like it’s made up of many villages, but you can make yours no matter which pockets you explore.